Ken & Chris visit the Algarve capital in the raging heat of june 20th -23rd june 2011.Temperature were up in the late thirties but the Algarve breezes kept it comfortable most of the time.I was ok with this but it was easier for me in my powered wheelchair than for poor Chris having to walk it. We stayed in a really nice 3 star hotel 10 minutes from the marina and old town,in the Best Western Dom Bernardo Hotel..."Twas" very nice and very friendly,very clean and a great breakfast every morning.We loved every minute of our stay! Although the heat was intense we were able to cope better than if at home in the UK in these temperatures.There is no doubt it is a very different heat most of the time.My wife was keen to get a nice tan to show off to her week-end workmates and we all love a bit of that,"do we not". The idea was to get first hand experience of the city so I could write with knowledge (or close to it anyway)and to get some nice photographs to show to you.This was the reason behind choosing an hotel 10 minutes from the marina and the magical old-town. We had heard the old-town was truly magical and wanted to see if it lived up to its description and reputation.It did!It is the first example I have seen where the entire circle of the medieval part was totally still standing.The old town was the highlight of our Faro-trip without any doubt. 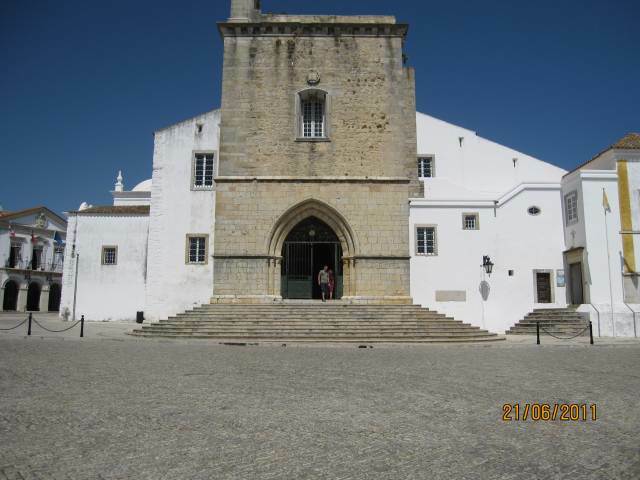 Above is the magnificent entrance arch to the Faro old town.Complete with its bell tower and storks nests.Later we take a walk inside and even a minature train ride through this wonderfull ancient part of Faro City! The walk down to the marina area was not too bad as it was all downhill.We did get lost once but a lovely friendly Portuguese lady noticed we were lost and though she did not speak English and we do not speak Portuguese,she managed to send us on our way in the right direction.We passed through a number of pedestrianised shopping streets before we hit the narina area and were delighted to feel a lovely cooling breeze.It was great to sit and have a nice cold drink by the boating area.It was not the most picturesque boating arena in the Algarve,like for example Lagos but the buildings and scenery around it more than made up for this. 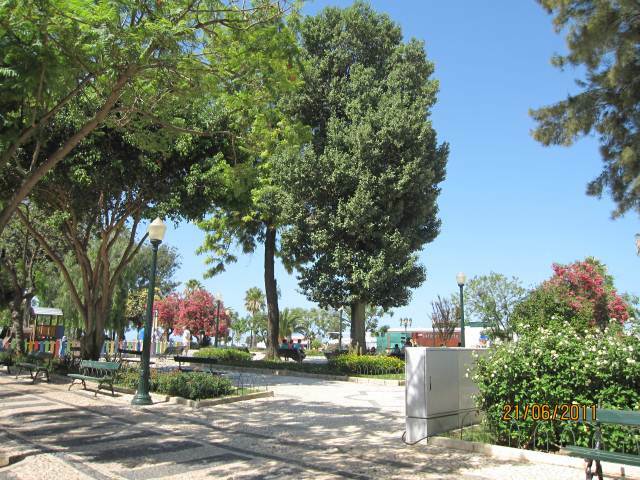 Below is a scene in the square next to the marina,which gives some idea of how pretty it is around the marina...The trees in the picture are very old Oleander plants.Normally you see them as very pretty shrubs growing to around ten feet but these must have been converted into standards a very long time ago and as you see have developed very sustantial trunks.They were even more spectacular than they are in the photograph.There were many planted areas we spotted which being a keen plantsman made my Faro-trip a lot more intersting. This shot was taken looking towards the Marina.The Marina is just a few meters beyond,so demonstrating what lovely areas are all around the boating area. This lovely park is just 50 meters or so from the entrance into the old town.Our first picture at the top of this page shows the entrance into the old town.Just past this little park you can take a Faro-trip on the little train.I say little but it is quite a bit bigger than the little minature train we see so often by tourist beaches.This train was able to take me around Faro as it had a carriage with a ramp on the back.I did not even have to pay as I am disabled,I do not even get that in the Uk.For a twenty minute or longer,ride around Faro this train costs about 3.50 euros per adult.I think children were able to go cheaper. There were lots of cafes and restaurants around the Marina area and generally they were reasonably priced,in my opinion.On the right as you look at the Marina is a very large and luxurious hotel called Eva,which has many balconies overlooking the Marina.We had a look inside and it was very plush indeed in the foyer area. Just past this hotel you can find the main Faro bus station and a little further still will bring you to the Algarve Faro railway station .So our Faro-trip to the old town and marina proved to be very well blessed,because there is so much to do and see and everything is in close proximity.Greatfor the disabled and for families with young children. 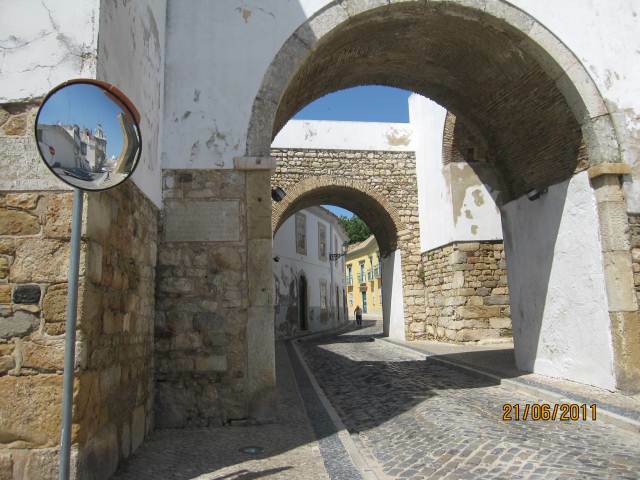 Above we see the double archway into the wonderfull Old Town. I would think the double arches were the rear entrance way for the delivery of goods and for letting in soldiers in a safe manner.Obviously both arches wouls have had heavy security doors and goods and soldiers would have gone in through the first arch which would close behind them,before the second archway was opened up.To the right as you look in there is a large area to the right which would i think have been to take loads of soldiers in one go,before closing the outer arch. If you look at our top picture on this page you will see that must have been the grand entrance for dignataries etc,only opened when there was no perceived risk. 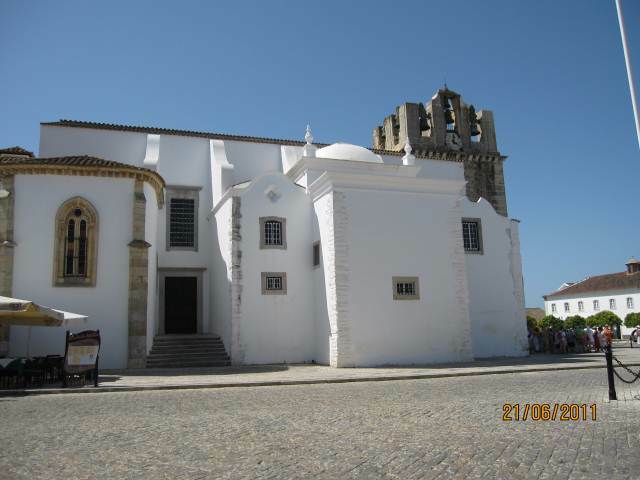 Our Faro-trip now goes inside the Old Town to look at some of the buildings.When you look at the lovely belltower in the picture above it does suggest this would be a cathedral.This is the first building you see as you come up the cobbled road leading from the front entrance . (our top of page picture)This is where you first notice the good vibes inside the old town,it does have a nice affect on your mood.I do not think life could have been too bad inside these walls. At a guess I would think it was mostly the rich who lived in here,the poor people probably lived outside the walls and walked in to do their various trades.Through the archways at the back,for sure! Our Faro-trip continues with another shot of Faro Cathedral below,it may not be the biggest but it does have nice clean architecture and really sits well in the large square inside the Old Town walls. 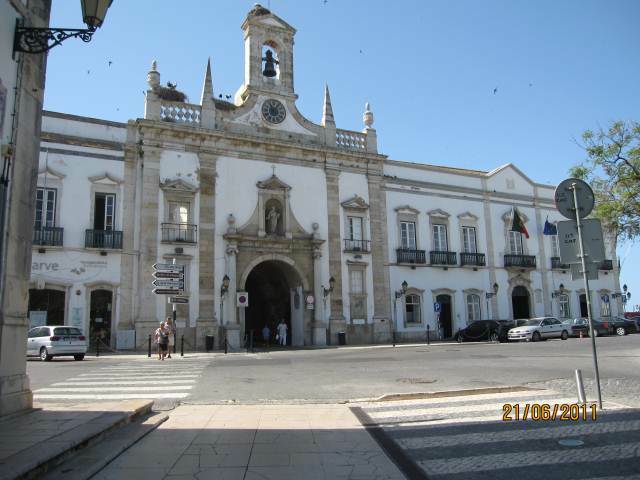 The Cathedral is the centre point in what is a pretty big and beautifull square.The whole inside of the old town is so well kept it appears almost pristine and makes a fitting tourism showpiece for the entire Algarve.If you visit the Algarve try if possible to visit this great tourist attraction.Try not to forget your camera as there is so much to photograph both inside and outside the Old Town. 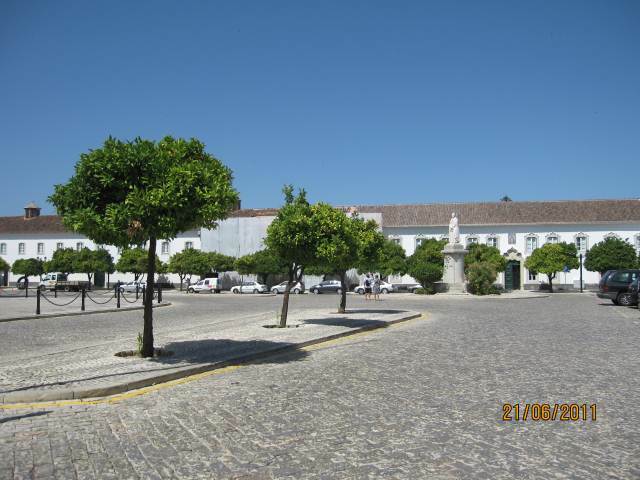 Another photograph from our Faro-trip showing perhaps a quarter of the area within the encircling walls,hopefully giving some idea of the size of the square. 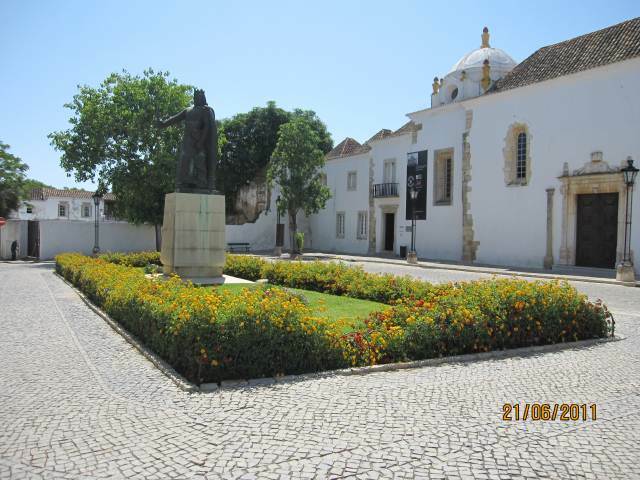 Still inside the Old Town is this garden and statue of King Alfonso,the great saviour of the Algarve.It was he who stopped the Spanish stealing the Algarve from Portugal in the 14 century..
address : Doca de Recreio de Faro. 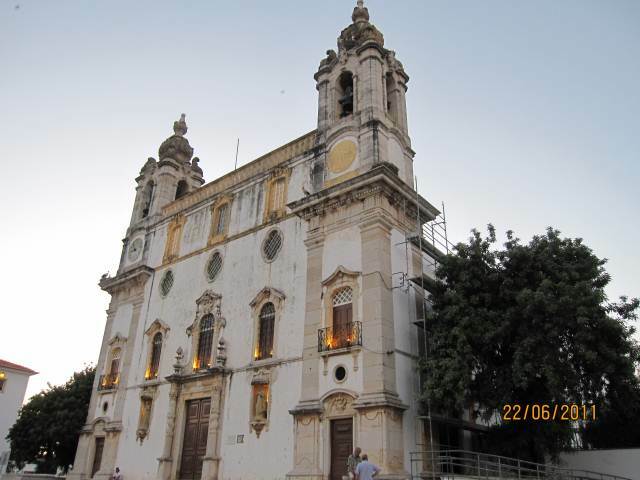 Of course there is also the Old Town I described above,do not forget that! It is a "Must not Miss". 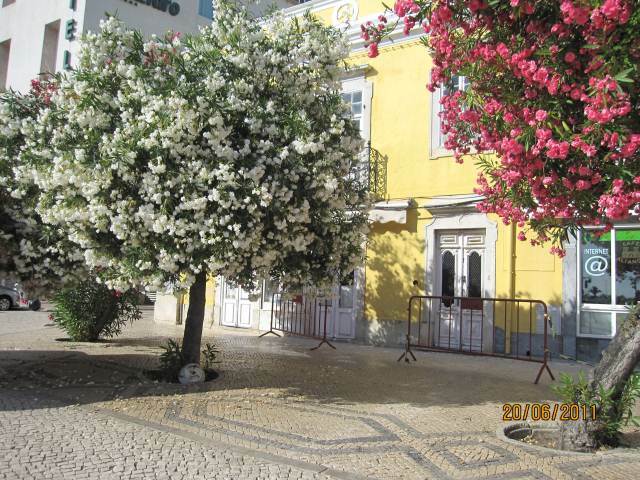 The Capela Da Nossos is Another "Should not Miss"on a Faro-trip. 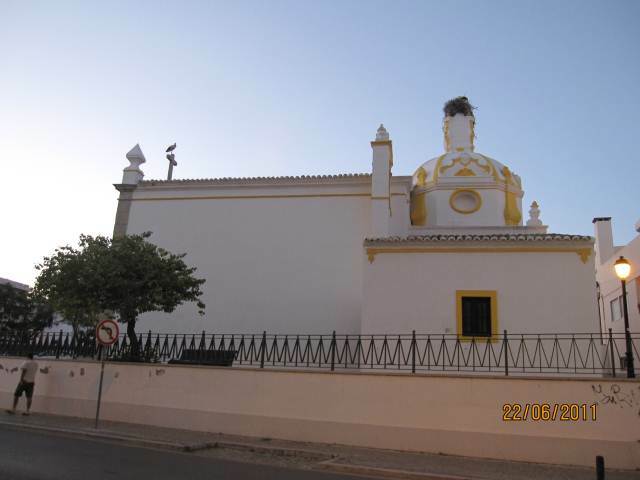 The Capela Da Nossos is a chapel of bones of great religious significance and a good but weird tourist attraction as it houses many bones.It is not a very big establishment but its is the 2000 skulls housed within its walls.Last known Cost was 1.50 Euros per person. There are more to be added as soon as I get time from other pages which need updating.Call it Work in Hand for the Faro-trip page.